Improvised Dash Cam using a Kodak Z70 pocket video camera. The dash cam has become popularized on YouTube, showing auto accidents and other events involving motor vehicles that amaze the viewer. Some show crazy drivers, accidents and other roadside scenery, both good and bad. Dash cams have been in use for decades, recording events as they happen. Law enforcement uses them to document officers in the performance of their duties, to use as evidence of the suspects behaviors and actions during the incident. A vehicle equipped with a dash cam can provide confirmation of other drivers’ and pedestrians’ actions, backing up statements of how an accident unfolded. Dashcams can be useful to protect and penalize. In some countries dash cams have become a required accessory due to the horrendous behaviors of drivers and the law’s lack of ability to regulate bad drivers. If you’re interested in having a dash cam, they are readily available from several manufacturers, starting for as low as $79. Understand that with any electronic device, you get what you pay for. The cheaper units have shortcomings…lower quality of image and sound track, storage capacity, reliability, field of view…the list is lengthy. 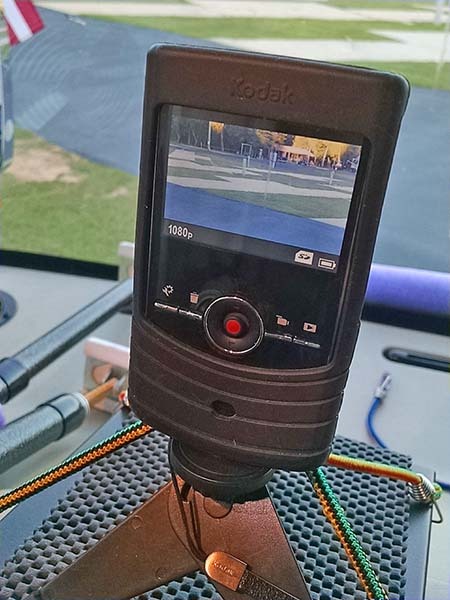 I set up my own version of a dash cam using an old Kodak Z70 pocket video camera mounted with small bungee cords that affix it to a small inexpensive tripod on top of my engine monitoring computer. It’s within easy reach to turn on and off. To activate to begin recording I use the camera’s optional remote control, which I have sitting on the dash in front of me. A quick press of a button on the remote and the camera is capturing events through the front windshield as I see them. The camera will continue to record as long as the memory card has capacity and the battery permits, which is a couple of hours. I can hook up the power adapter for longer usage. I only turn it on when I feel the need, when I see someone driving erratic, or traffic and road conditions warrant. So, before you go spending money on a dedicated dash cam, try using one of your old video cameras that you rarely use now. With a little planning and proper setup you can help protect yourself from another driver’s poor decisions and driving practices, and capture some unique events as they happen.